Listen, for I will speak of excellent things and from the opening of my lips will come right things. What comes to mind when you hear the word “excellent”? The dictionary defines excellent as exceptionally good; extremely meritorious; superior. When we think upon this we might come to realize that a lot of our daily speech might need to be upgraded. Today let’s look for every opportunity to speak about excellent and right things using wisdom and understanding as we do so. 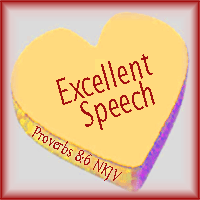 Dear God, today I want to focus on having Excellent Speech. I want to speak things that are exceptionally good,or anything that has exceptional merit, or is superior. To me that would mean rightly choosing to speak the uplifting and encouraging truth of God’s word into every situation I encounter during my day. I don’t want to speak negative words or angry words, but only excellent words that are filled with wisdom and understanding. I want to speak excellently at just the right moment, so that the words I speak might have the opportunity to change the atmosphere of my day or someone elses day for the better.